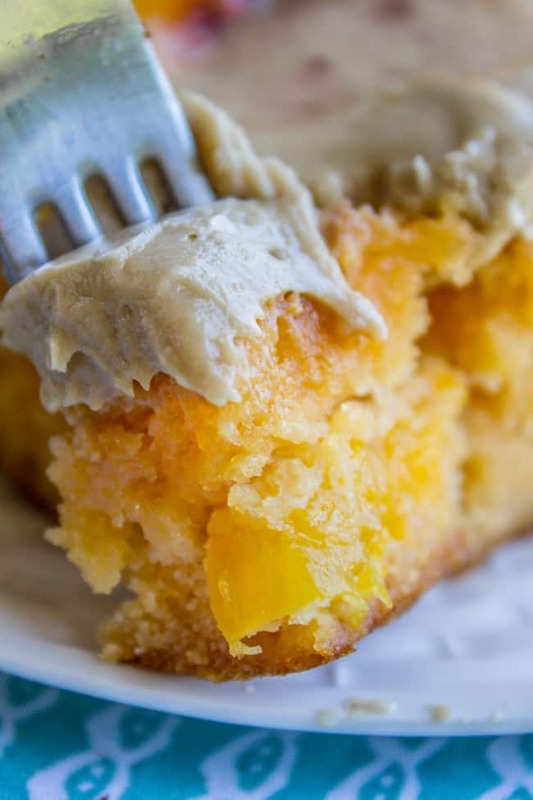 A delightfully peachy cake made from a cake mix and a packet of Jello, of all things! There are real peaches in the cake, which makes it super moist (ok, and a lot of oil). It is topped with a rich brown sugar frosting! My sister Nikki wrote a book and now it’s published! And it’s being released TODAY! You can buy a print copy OR the ebook on Amazon. I’m so excited that I even added a link on my sidebar over there. I’ve been reading this book from draft one. 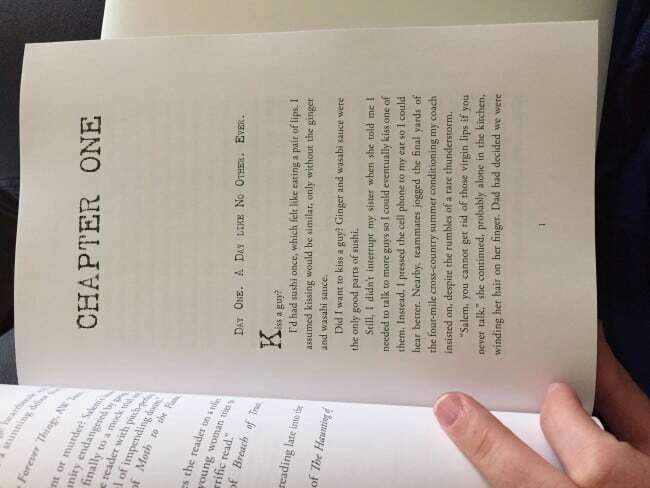 Nikki started writing it about 5 years ago and has been working to get it published ever since. It’s finally here!! Want to see the back? Salem is a shy high school girl whose sister (and idol) was killed in a freak gas explosion. (If that wouldn’t shatter you, I don’t know what would.) But she’s starts to realize that Carrie’s death was no accident. 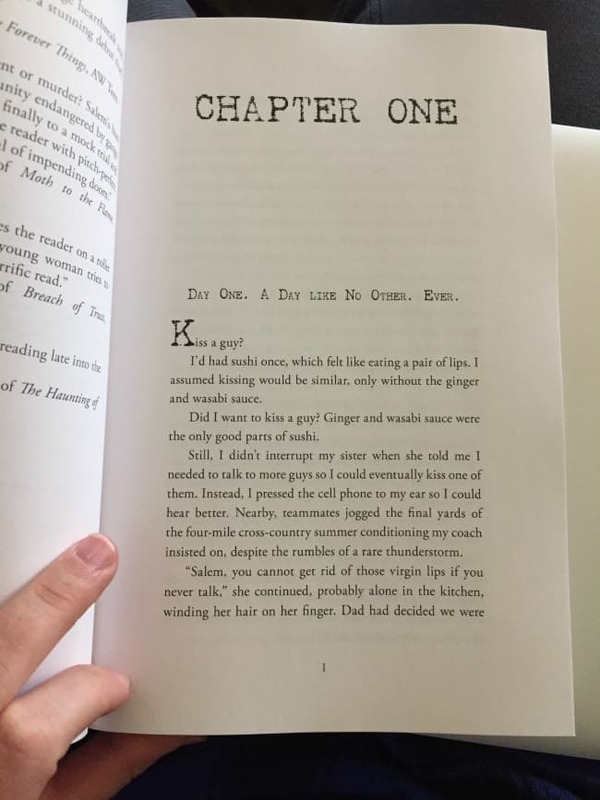 You can read the whole first chapter if you click the “LOOK INSIDE” link right above the book cover on Amazon. It’s so good!! Check it out! I love this story so much! Did you know that authors often have very little control over the marketing aspects of their books? Including the back cover synopsis. 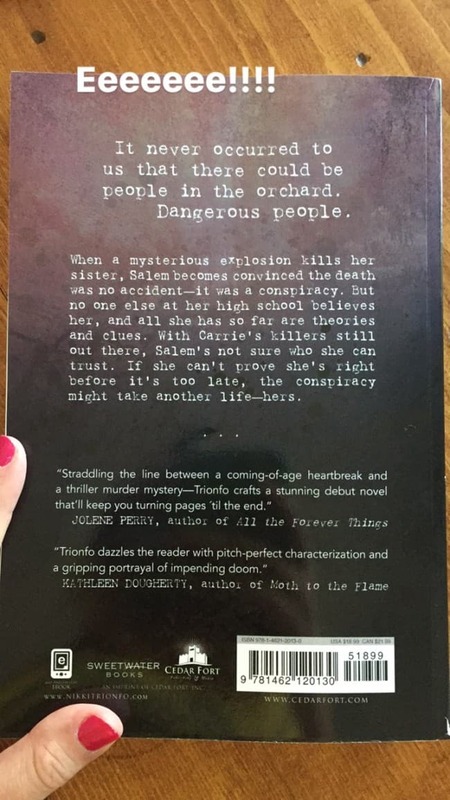 What it doesn’t mention is that there is a frenemy-type romance that’s pivotal to the story: Cordero, super hot and mysterious gang member, who Salem’s trying to get information from (to answer questions about her sister’s death.) He’s my favorite character! If you want to buy the book, the easiest place to get it is on Amazon! Shatter Book Launch and Dance Off: if you live near Riverton, Utah, come to the book launch next week! I’ll be there! Nikki put me in charge of judging the dance off. SO excited!! There’s a giveaway you can enter right now, here on the blog! 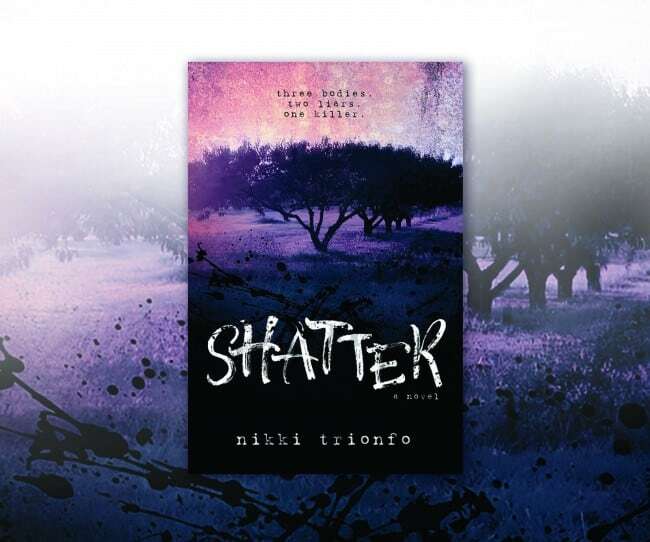 All you have to do is COMMENT on this blog post, and answer this question: What about Shatter makes you most want to read it? 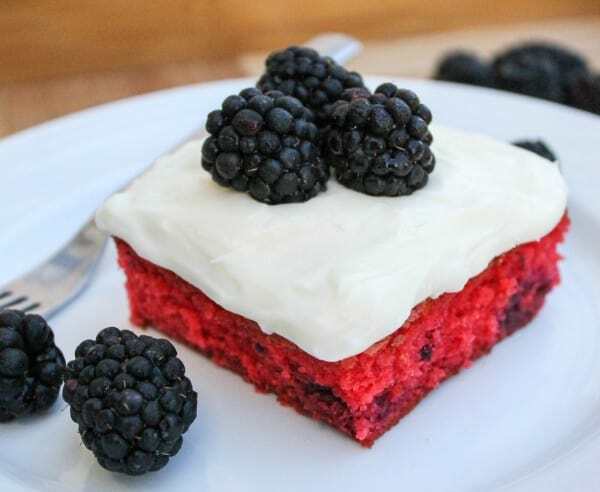 Have you ever made this Blackberry Cake with Coconut Cream Cheese Frosting? It’s a yellow cake mix with a packet of raspberry jello and a pound of frozen blackberries. Sounds weird, but it’s delicious and is a HUGE family favorite around here. 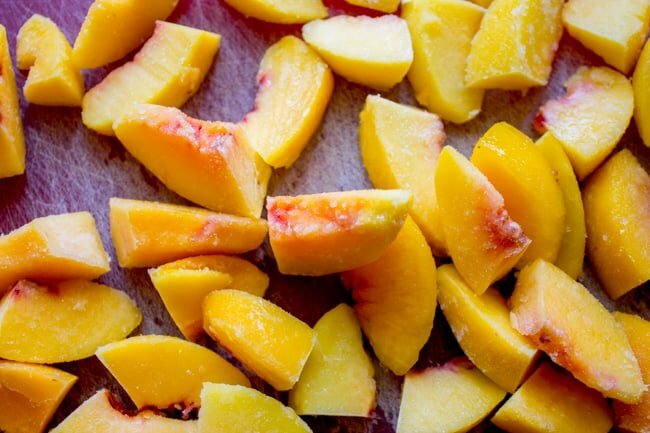 Cut the sliced peaches in half. This is the frosting. Left: before ice bath. Right: post ice bath. 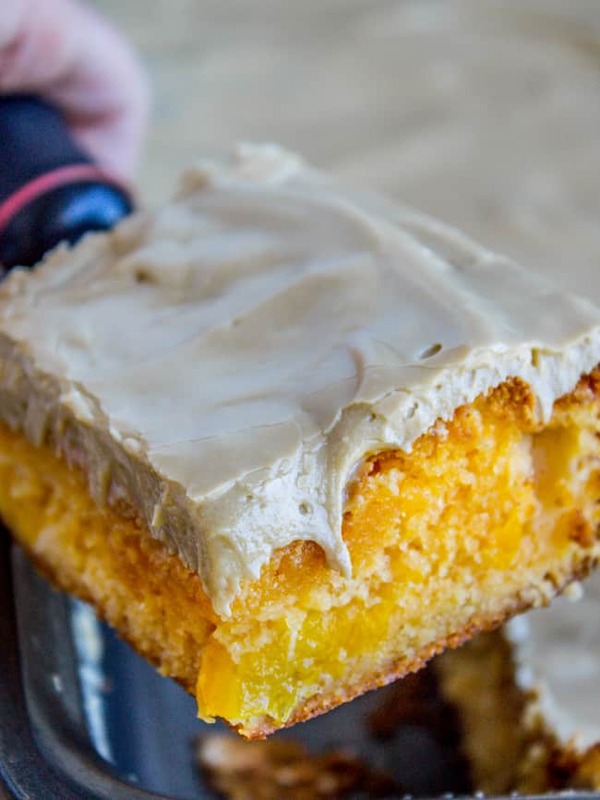 I turned it into a peach cake: yellow cake mix, peach jello, a pound of frozen peaches, and BROWN SUGAR frosting, which almost borders on caramel frosting. The jello is what makes the cake so delightfully orange (or pink, in the case of the Blackberry Cake.) The corners are my favorite part. The edges of the cake get very brown but they do not dry out. Instead they are ultra chewy, the opposite of most cakes. It’s ridiculously easy to make and it’s SO GOOD! It’s also super rich. The cake is sweet and the frosting is even sweeter. It is the same super fudgey frosting that goes on top of Nana’s Famous Fudge Brownies, except I left out the chocolate and used brown sugar instead of white. The result is an ultra decadent, caramel-y icing. I brought this over to my friend Sarah’s house today and she told me that she hates Jell-O and hates box mixes but she loved this cake. WIN! Just look at that chewy edge!! Grease a 9x13 inch cake pan. In a large bowl or stand mixer, beat together the cake mix, 2 boxes of peach Jell-O, 4 eggs, and the cup of oil. Open the bag of frozen sliced peaches. Cut each slice in half so they are a little more bite size. 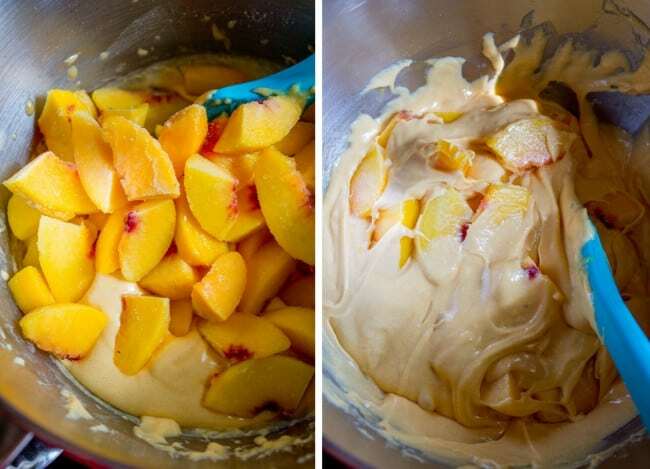 Use a sturdy wooden spoon to fold the peaches into the cake batter. Bake at 350 for about 40-45 minutes. Check the center of the cake with a toothpick; if it comes out without batter it is done. (very moist crumbs are ok.) The edges will be quite brown. Let the cake cool completely on a wire rack. While the cake cools, make the brown sugar frosting. In a 2 quart pot, add butter, brown sugar, and heavy cream. Stir together over medium high heat until it reaches a boil (bubbles all the way across the top). Set a timer for 1 minute and stir frequently. Remove from heat. Stir in the vanilla. Prepare an ice bath. Set the pot of frosting in the ice bath (don't get water in the frosting!!) Let the frosting cool in the ice bath, scraping sides occasionally, until the frosting is room temperature and much thicker. See photos. 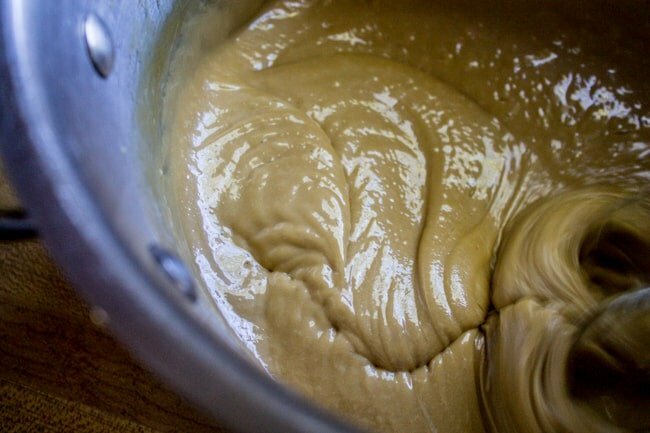 Use a hand mixer to beat the frosting for about 3-5 minutes, until it is thicker but still pourable. This keeps on the counter for a day or two, but after that I would put it in the fridge. Good luck keeping it around that long! 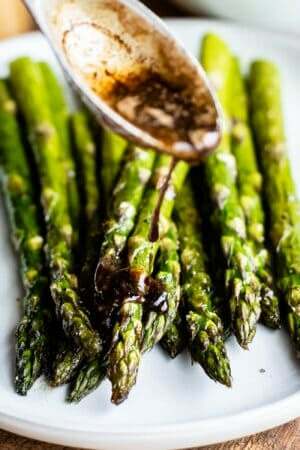 * I like to use light tasting olive oil, but you can use any vegetable oil. **I've never tried it, but I think this would work fine with fresh or canned peaches. Just make sure they are drained VERY well. I wanted to try the recipe with fresh, but it's May and they just aren't available yet! More fruity cakes you will like I’m sure! Blackberry Cake with Coconut Cream Cheese Frosting << this is the original cake for today’s recipe. I just did peach instead of blackberry! Follow this link to get the cream cheese frosting recipe. 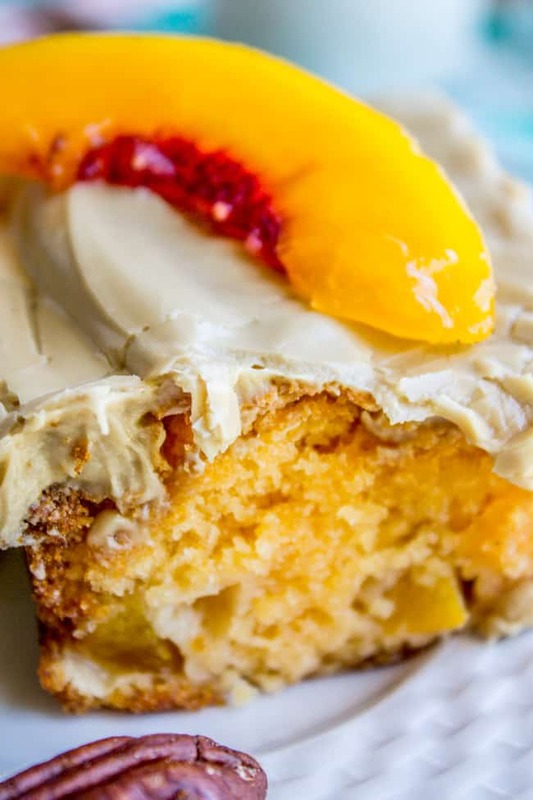 It would taste really great on today’s peach cake, if brown sugar frosting isn’t your thing. 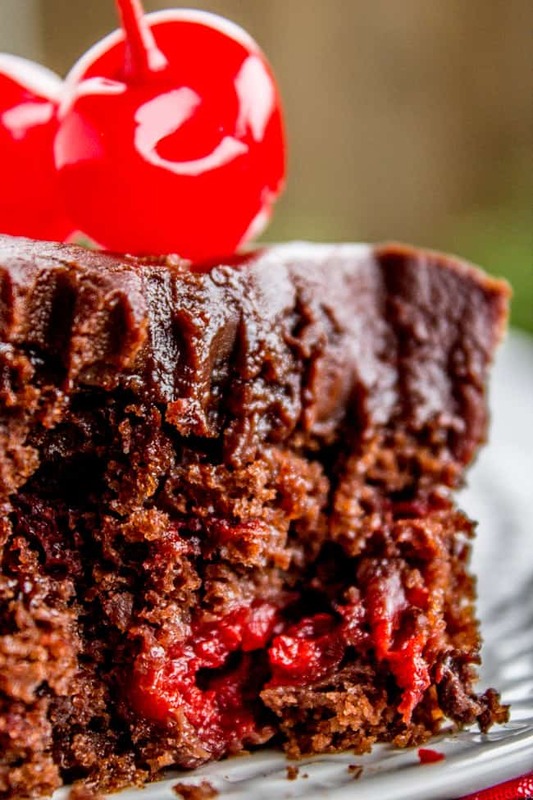 Chocolate Cherry Sheet Cake with Fudge Frosting << So decadent! 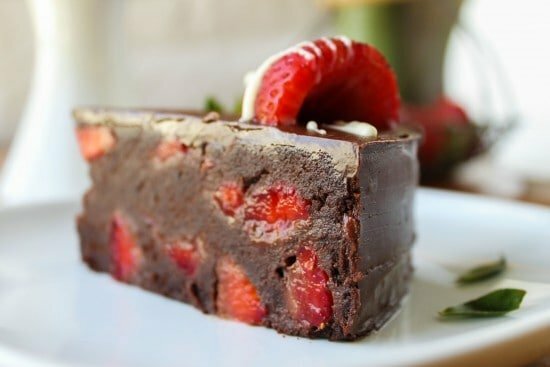 Strawberry Truffle Cake << You get to make a cake. And then smash it. Then add strawberries. So fun! More peach cake to love! Followed directions exactly. My cake fell in the middle and the frosting was not purable but I was able to spread it on. We will eat this evening for dessert but unless it tastes unusually good I will not make again. Hi Gail! I’m sorry the cake didn’t work out for you! This is not a traditional cake (I mean. It does have jello in it ;) so yes, sometimes it does fall a little after coming out of the oven. It shouldn’t be so bad that the frosting doesn’t cover it well though. As for the frosting not being pourable, I think that just means you either cooked it a little too long or left it in the ice bath a bit too long. I hope it tasted good! 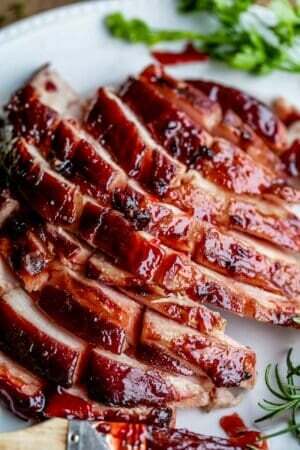 I would like to make this with fresh peaches. Would I need to add more liquid? 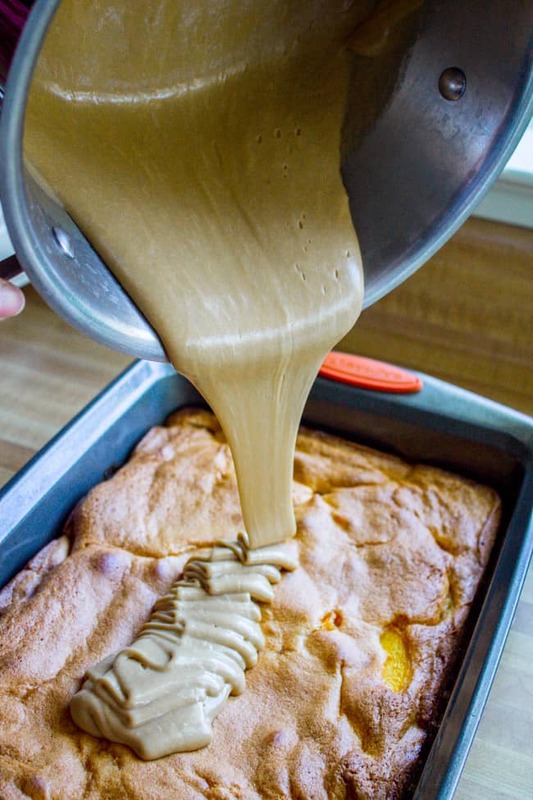 My family loves this cake so much I have to double the recipe and I can make it ahead of time because it tastes even better cold! This cake IS really good cold!! You’re a genius Linda! I love that you always have to double it, that’s awesome. Thanks so much for the positive review!! They only had sugar free peach jello at the store. Can that be used for this cake? Can I add sugar to the jello? And my frozen peaches are thawed out can they still be used? Thanks so much. Hey Teresa! I was on vacation, I’m sorry I didn’t get to answer your comment in time. This cake is already so sweet, I bet sugar free would be just fine. Did you try it out? How’d it go? 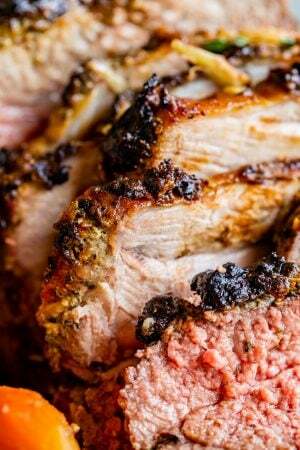 This recipe looks mouthwatering, I just had a quick question.. 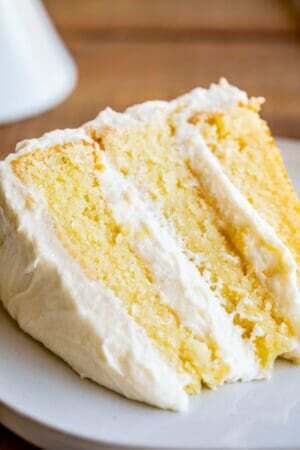 I prefer making cakes from scratch, and I was wondering, would you happen to have any yellow cake recipe that I could use for this cake instead of the yellow cake mix (I would still use the Jell-O, but the egg/oil amounts would probably have to be modified)? Hey EM! I actually DON’T have a go-to yellow cake mix because I’m absolutely addicted to box mixes! I’m sorry, that’s so lame! Putting this on my to do list! Check I am Baker’s site, she’s definitely got one. And her cakes are amazing! This cake is delicious. The baking time was way off. It took 1 hour. Next time I make this I’m going to partially thaw the peaches. Very Rich! I’m not even kidding, this is the most delicious cake I have ever made in my life. I had intentions of giving some to the neighbors but my husband and I didn’t leave any! The peach flavor of the cake is delicious; I have never thought about using jello in cakes before. Makes a huge difference. The peaches are a great way to add fruit without the messiness of fruit between layers, which I have never been good at. The icing is easy to make as well. Heat the cake up a little, add some vanilla ice cream…delicious!!!! I made this using fresh peaches. The flavor was awesome and I received VERY positive responses. The only issue was the cake fell in the center. I did bake it for 45 minutes at the correct temp and tested with several toothpicks. Why did it fall and what can I do h to keep this from happening again. Hey Denise! I’m so glad you enjoyed the cake! I’m wondering if the extra moisture from the fresh peaches caused it to fall?? My cake also fell. I used frozen peaches. By the second day it was only about 1/2 ” high! Still was delicious and quite moist. I used cream cheese icing. Hey Carolyn! I’m not sure what could have happened, 1/2 inch is so tiny! I’m glad it still tasted good! My frosting does not look like the pictures. Looks like caramel and I don’t think it will get crusty like yours. Followed the instructions closely, Any ideas? Hey Mary! I’m wondering if you accidentally cooked it too long? Or perhaps didn’t beat it long enough. Since I wasn’t in the kitchen with you I’m afraid I’m not much help! Referring to the peaches in your recipe, do you mean “thawed”? Unthawed means not thawed or frozen. This looks wonderful. Peach season will soon be here! Any idea if a Bundt pan would work? Hey Janet, I know I’m so excited for fresh peaches! My parents have a tree, I’m so spoiled. I think a bundt pan would work! You will have to bake it longer but I’m not sure on times. Let me know how it works out! Ohhhh, I love mysteries. Sounds great. I love a good mystery. I always read the back of the book first! I can’t stand the suspense! Oh my gosh, Karen, I have heard you talk about this book for so long that I cannot wait to get my own copy and make Nikki sign it for me!! You will, right Nikki?!? Can’t wait for the book release party. 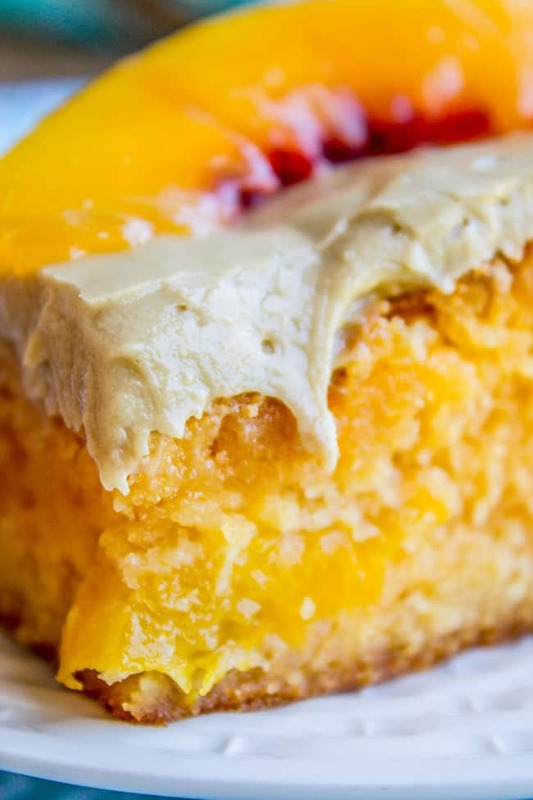 I love peaches so much and this cake recipe is right up my ally…boxes and all. I love easy things that taste amazing! 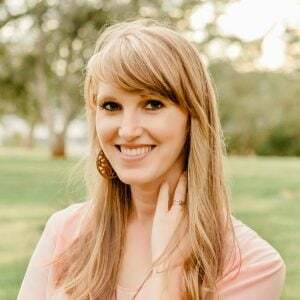 Congrats on your novel, Nikki! And Karen, that frosting looks so good! BTW, I posted the coleslaw recipe if you want to see it :). Ooh yes I want to see it! Heading over now! Thriller/Mystery in the world of food…count me in! I love a good mystery. I am always looking for new authors. Congrats to your sister on her book being published. I’m always looking for a good book…and as our household is a big fan of the Gifford household, we will take Karen’s rousing enthusiasm as a positive recommendation. As far as peaches go- I grew up in a small town where peaches and almonds were the main export crop. In the early spring, when winter has stretched one’s soul to the limit, the trees begin to bloom: Almonds with white petals, peaches with pink. Orchard after orchard, the promise of spring unfolds… and even as the petals fall, they carpet the new grass below, like a happy snow. Knowing how peaches start and what the final result tastes like- I love the ironic twist, knowing there will be a good smashing involved! To be honest I am not sure I would read this but my teenage daughter would probably enjoy it. She loves mysteries. I love that it’s a mystery! The tagline sounds really intriguing, and I am curious to know what the conspiracy is and who committed the murders. The face that Nikki wrote this is what makes me most want to read it! I’m semi-related to an author! Yay! Also, I have peaches in my freezer to make this cake, which also makes me happy! AND, I followed your instructions and used your link to BUY MY ONE KINDLE COPY! Yay again! I told everyone that if they bought a copy, they’d get a gif from me. I hope it works! Your family is so supportive! I feel like I’m a member of your family just like Karen is. Way to be awesome. It’s been awhile since I’ve read a mystery so that’s why – plus peaches are my favorite fruit! Great job Nikki! That peach cake looks luscious!!! Can’t wait to read Shatter as I love murder mysteries!!! Thanx for the chance to win. Take care……. Well, I’m kinda cheating since I’ve read it but honestly my favorite part is her trying to figure out Cordero throughout the book. SO GOOD!!! 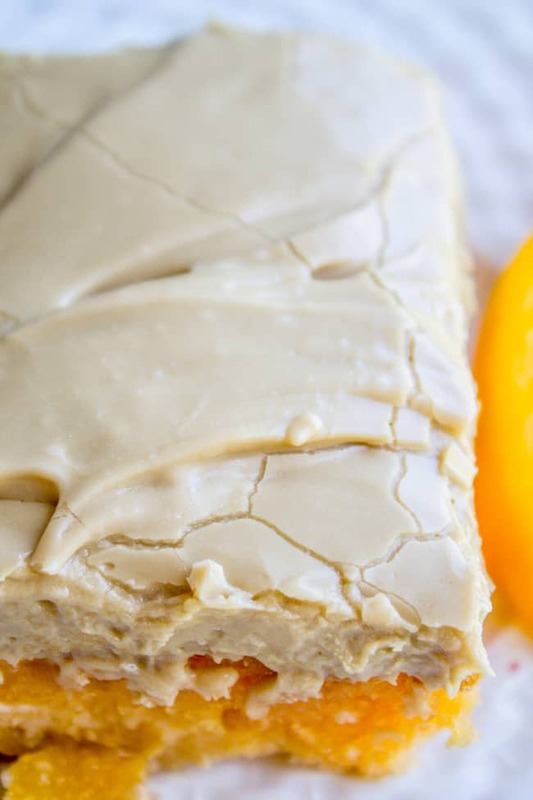 this cake looks so good – i’ve never even had peach jello but i love jello or pudding cakes. the blackberry one looks awesome too! and what about shatter makes me most want to read it? because i love any type of whodunit! aside from cooking shows/cookbooks it’s practically all i ever watch/read, haha. my partner is often busting my chops about it, even :) congrats to your sister! love the fact that its a thriller set in the food world! 2 of my fave things combined!!! I always like a good murder mystery book. I also don’t like peaches so I am glad that they all get rotten.